After her conversation with Ursula at Bear Essentials, Rhea bicycled straight to the barn at Benden Farm, making the mile plus in record time. The classic wooden structure at the bottom of the hill from the house seemed blessedly empty of people at the moment. She breathed in its characteristic smells of straw and animal feed and walked in past the small tractor and its attachments, plus assorted carpenter and garden tools. Most of the latter were hung neatly on the wall in their appointed places as Carlos was a stickler for orderliness (“You’d think he had Swiss blood,” Cali often quipped). But a few were jumbled against the wall as if someone had just left them recently. She listened for activity outside and didn’t hear anything but someone could be just around the corner. No matter. Not at all inclined to linger in the working part of the barn, she wound her way up the intricately decorative spiral staircase – welded by Johan when he was first getting going. In contrast to the tidiness below, the huge upstairs loft was a creative jumble. Soft couches draped with India prints and old blankets lined the walls joined by colorfully painted booths garnered from a restaurant remodel. A low stage at one end held a drum kit, a marimba and a pair of conga drums in stands. Other percussion toys, as well as a tuba and two trumpets were jumbled here and there. Instrument cases indicated more musical riches, as did an appropriately battered upright piano. There was even a pull down projector screen that bespoke evenings curled up in the couches watching movies. Colorful banners and an earth flag dangled from the rafters. Huge paintings in very different styles hung on the walls and there was a partly finished mural on the floor in the west corner that looked like a new group effort. A few beer bottles and cider jugs indicated another recent use of the space. Rhea smiled at the memory of that evening. It had been fun adding Uri’s amazing didge playing to their eclectic mix. She wasn’t much of a musician so the instruments didn’t call her but she made a beeline for the sound system. After a few minute’s search, she found what she was looking for among the jumble of CD’s on and under the table. Loreena McKennitt. The Visit. When she was at the store she hadn’t consciously noticed it, but riding home she realized that Ursula had been playing “Tango to Evora” – the theme music to the Burning Times films a bunch of them had watched together last year at Halloween. If she was going to take Ursula’s witchy class – for that’s how she thought of it – then she needed to come to terms with the fear in her body over the thought of exposing herself in that group – or to the community at large. To do this was taking a big step in owning what she had known about herself ever since weeping over those movies. She slipped the CD into the player and that song on repeat. Taking a deep breath, she stood quietly as the music began to fill her. Shivers washed along her spine when the wordless female voice began. Good. Rhea had learned that shivers meant she was on the right track. An image from the film ran through her mind: a lone figure playing a violin on a hill top. Rooted there, strong in her convictions about her wisewoman self. Strong in her memories. Then and now. 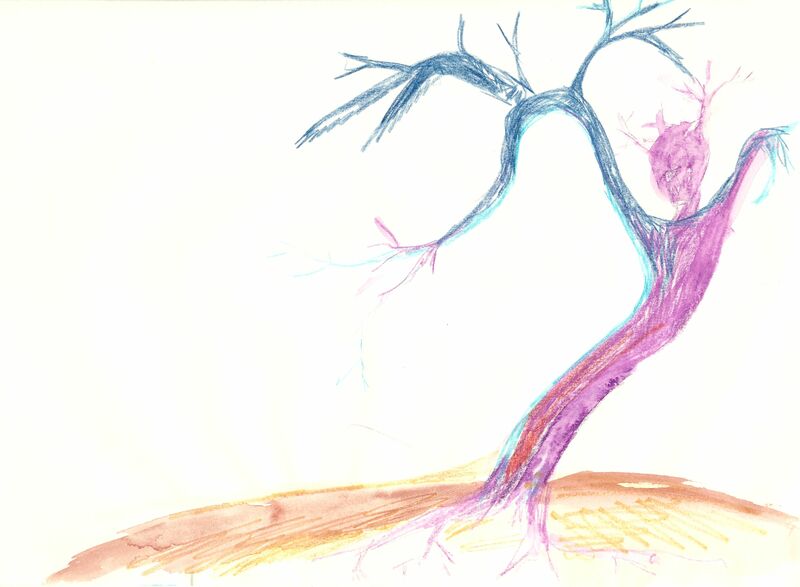 With the thought of those generations – eons – of strength, Rhea began to feel herself as a tree, roots going down, branchy arms beginning to wave, trunk swaying. Thank goodness she’d learned about grounding from Ursula the other day at Illahee. Rooted, she could face the music – literally – and begin to dance. Another image from the film flooded her: a woman, cape flowing, wending her way down the narrow alley of a medieval stone town. Her terror of hounding persecutors was palpable and Rhea took it in. Owned it. Re-membered it in her own body. Darting here and there in this familiar modern setting she knew the feeling of being chased, even as she was driven by her need to counsel a sick old one, tend to a woman in labor, heal a neighbor child’s infection. Her basket of salving herbs was on her arm, she had only to get in the door…. this time. Yet inevitably another alley and another door awaited. New fears and new betrayals. Soon the fires burned and screams filled Rhea’s being. Her own. Her friends. She choked and moaned until shrieking, her body whirled and dashed, seeking refuge and other times. Yet, still the beleaguered images came. A dark-skinned Romany woman in ancient India. Men on horseback swooping viciously. The colonial village of Salem, Massachusetts. Neighbors shrieking. Fingers pointing. Priests and sanctimonious ministers torturing, condemning. Dance the pain. Dance it out…. Swooping and swirling in the storm, treelike, to bend but not to break. Promises of future success…. Was now the time? Here at the beginning of the 21st Century. This life, these people. Could they betray again? Possibly…. As terror threatened to well again, there was a sound at the top of the stair and two men appeared. Rhea gasped and, still the grips of the dance, flung herself towards them in a fury. A tall African-American man – dark brown skin and curly dreaded mop bouncing – and a slim Asian with features blurred by Russian and Mongol parentage. Yet their stance was open and their expressions warming enough that the steam went out of her engine. Panting she slowed and then bowed as with a look at each other, the men dropped their bags and danced towards her. The music swelled again. Fingers touched lightly. “Arlo and Uri.” She breathed their names, turning slowly in a circle as they wove a dance around her, their maleness softened by their need for her to feel safe and loved. Soon she let herself go again as new images whirled past her. African villages where the wisewoman was honored. Asian steppes where the drummers were women. Arawak healers in the Amazon jungles searching out and brewing the powerful vision medicines throughout the ages and doing it still, sharing their skill and lore with seekers from the north. All were part of their world’s heritage. If these dear men were any evidence, the times truly were changing. The ancient ways were re-emerging even into this dominant, increasingly tortured culture. She knew she could trust these men and the women around her. Rhea blinked…. For Cali was here too now and Carlos. Jay and Fern. Ariel. Circling, they all joined hands. Someone had changed the music. No longer a lone tree or a solo beleaguered witch, she was in a safe circle of beloved souls, triumphantly dancing their new world into being. She thought back to when it had all really come to the fore in a Healing Group session way back in the late 90’s. It had been her turn to be in the center of the circle with Pia, Molly, Cindy, Chloe, Stella and Owen. It wasn’t that she had any particular aches or ills but rather that they were practicing hands-on healing with each other. Usually at Ursula’s house. It was a stormy day, the rain beating on the south facing windows making the cozy fire in the stove all the more welcome. Ursula lay on her belly on cushions covered by a light wool blanket. The others sat around her, first breathing together quietly to center and then softly toning in a blend of voices that incorporated Owen’s deep bass and the women’s altos and sopranos. Some molded their mouths to create the eerie melodic overtones that seemed to come from another realm than their own throats. After a few minutes without any discernable signal, the toning quieted and someone started a simple chant they knew well. “Oh, purify and heal us, heal us and free us.” The chant repeated for many rounds, sometimes softly, occasionally almost shouted. A few tentative harmonies came and went. A rattle sounded and Pia’s frame drum began a steady heartbeat. Ursula lay still, feeling the energy swirl around her, trying to empty her mind of her fears. “I am safe,” she reminded herself. “Loved. These are special friends all on a journey together.” She knew about their wounds…. It was time to open again to her own…. As the rattle crescendoed and then abruptly stopped, Ursula took a deeper breath and felt the others respond in kind. Then hands settled gently on her upper and lower back while others touched her feet and arms, and gently cupped the crown of her head. It was impossible to tell whose hands were whose and in fact it seemed like way more hands than the number of people she knew were there. “Stop trying to figure it out,” she told herself firmly. As Stella spoke Ursula felt waves of nausea and began to twitch. They had uncovered some past lives on Ursula’s body before that were important revelations about her relationships with her “growing up” family and with Charley but this one struck at her core in a new way. “Breathe into your panic,” Chloe instructed. “Breathe into her panic,” Owen ammended. Soon Stella was describing seeing Ursula in a past life as a healer witch woman being chased after leaving the home of a patient. Looking back now, Ursula remembered being of two minds about this revelation. One part of her was saying, “Of course! It makes perfect sense. Now I know why I’ve been drawn to all this stuff for so long.” Yet, she knew she was about to be incredibly sad and that it was going to be hard to bear. They had begun to talk about what they were each receiving. Ursula would have a questioning thought, “I wonder what that would feel like?” and then impressions would come into her mind. Not like a screen she was watching. More like her imagination being very fertile and emotive. When she thought of it like that she would immediately become suspicious of herself, “I’m making it all up.” Yet she felt impelled to relax and go with it. Certainly there was no denying the increasingly strong feelings besieging her, all aspects of her body/mind now fully engaged. “I have the impression it is my own village folk chasing me, not an organized inquisition group. A hectic, angry mob that knows me and wants me to be a scapegoat for something…. They’re very scared…. crop failures, famine…. they need someone to blame….” She could empathize with their fright and anger, yet their pain only magnified her own…. and…. betrayed, betrayed by people she loved and was helping…. Ursula thought of the hysteria in The Crucible. Back in the present for a moment, the store quiet around her, Ursula took a sip of her comforting tea and picked up a small statue of the ancient Mother Goddess. Fat and round, a clay model of the Venus of Willendorf, it fit into her hand providing tangible comfort. Soon her mind’s eye slipped back to the Healing Circle remembering how she had propped herself up on her elbows weeping, weeping hard – snuffling and wiping her nose on a tissue Cindy handed her…. Another awful feeling arose…. She almost knew who the betrayer was…. Could sense a presence…. Was he or she in the room with her here? “Were you burned?” At first Ursula had thought Stella was referring to the marks on her arm from the previous day’s brush clearing around her house. Then she’d immediately had a strong image of herself tied to a stake. In fact, she’d had that image several times in the previous minutes but hadn’t mentioned it. “Yes,” she whispered turning over and sitting up. “And my children and grandparents were watching. Don’t know if I even had a husband. I left my body quickly – I knew how to do that. But they didn’t realize I was no longer in my body…. Their pain was worse than the fire. I get the sense I was a loner for many lifetimes after that….” Tears were running down everyone’s faces. Owen’s strong arms held her from behind as she shook and shivered – her body wracked with reaction. It was hard to breathe into her agony yogically with her nose plugged up with tears. “Betrayer and betrayed,” wailed Pia. “Atlantis, Crete, the Russian steppes. Over and over,” intoned Stella fiercely. “We can only be free to move forward when we have healed these ancient past life wounds.” Stella went on to warn Ursula to take good care of herself in the coming days. “Take a bath filled with flowers,” Chloe counseled. “Be sure to journal this,” Owen reminded her as they stood then in a circle with arms wrapped around each other, noting each other’s swollen eyes and puffy noses. Feeling so blessed to have uncovered another of the stories they had been holding inside them. For each knew they had their own version of the tale. Uncovering one wound helped them all. Ursula remembered going home and blurting out her tale to Charley where he was weeding in the garden, before even getting into the house. His long hug had been a healing balm down to her very center. For several days she had been aching, battered and sore – wild jolts coming whenever Charley put any pressure on her scapula or held her close. He had sweetly held her close a lot. She’d had moments of sobbing again as well. During the night she cried about that village wondering how they managed when the next woman went into labor after she was gone…. or the next child got sick and needed a special herb that only she knew where to find. What did they do then? But the image of her children of that life was the most haunting one. It made her heart hurt and sent her into sobs a number of times. No wonder she had this thing about wanting her present children close by. Some additional images came of other lifetimes, other horrific purges, but they felt more speculative on her own. She also had some flashes about people in her present life who might have been in some of those, but not knowing what to do with these thoughts she tucked them into the back of her mind where they still lay. Mostly she had walked around feeling like she was in two worlds at once. The normal everyday one where dinner must be fixed and they watched a funny movie and she brushed her teeth. And then the numinous one – a momentous new sense of herself stretching back through the ages. A parallel universe that was very real and affecting her physically. Was it only the gorgeous sunny spring weather and the bursting wild flowers on the Mountain that made everything so crystalline and poignant? Her back was spewing images, vibrating, shimmering. Achingly alive with a mind of its own. One of the most vivid after-impressions was that there had been a promise from the Goddess as Ursula called out for help during the chase. The promise seemed to be that the ancient ways would return and that she would have a hand in remembering them and live to see them active in another life…. This life…. She had held on to that assurance in the ensuing years since the uncovering of that past life in the Healing Circle and others on Stella’s and Chloe’s tables. I am starting a class on Magical Basics to be held Thursday evenings from 7-9 pm at my house on Mountain Lane. I’m thinking for starters we’ll cover techniques of grounding, calling circles, using your healing hands, clearing space, smudging, creating altars, doing ritual and setting intention. You’ll have a chance to help at the seasonal community rituals and will also gain skills to help with your personal journey. Suggested payment is $10 per class but the Begging Bowl will accept any amount. More will help cover costs for those who can pay little or nothing. Trades are also a possibility. “Anything?” the little sprite asked. The little girl spun away from her across the sand to the waves with her cougar bounding Tigger-like beside her. A rush of joy made Thea giddy. It was as if she herself had just breathed in a freedom that brought with it a whole new set of possibilities. In the next moment a gull swooped down into Thea’s peripheral vision, bringing her to a standstill. Stunned, she realized it was as if she was actually inside a painting done last year before moving down here. A scene that had come through her paintbrush was happening now. She remembered struggling to settle down to the assignment from her group to paint her True Self. A preliminary Tarot spread told her to let go of her head, her ego, her rational side. “Not an unusual message for me that year. Or still,“ she thought with chagrin. She had smudged, lit candles, and prayed to the Goddess as was her practice to help with that letting go process before picking up a brush. She started in with a red swoosh which became part of a multi-colored stormy spiral. 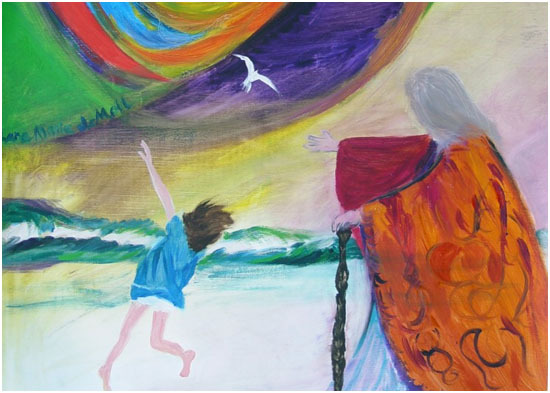 Then into her mind had come the image from a photo she’d had on her wall since college: reaching ecstatically towards the sky, a little girl twirled almost out of control, ocean waves behind her. A gull had gone into her painting high above the child. Thea brought herself back into the present with a shiver, the hair standing up on the back of her neck. Here she was with the not-quite-real little girl who was her lost soul self dancing towards the waves with the gull swooping and herself waving the child on, saying, “go for it!” Indeed this was just the way the painting had given her permission to move forward at the time it was done. Wow! She wasn’t wearing her orange ruana today though she really did have one. It wouldn’t have been warm enough on this windy beach. But she knew she was in the proverbial cloak of power that shimmered around her more and more these days. Ursula grinned at Owen as Thea burst in the door of Bear Essentials about twenty minutes after her excited phone call. “The paintings are coming alive!” She described what just happened. “Don’t you think we’ve been there?” Owen said as he lovingly handled a particularly beautiful rose quartz that he’d always admired. “Yes, Ursula, it was partly this store that made me choose Mahonia to move to,” said Thea. She flashed on the voice she’d heard as she finished the Mountain painting, but decided to hold her tongue for now about that. “Is that the limb I’m out on? 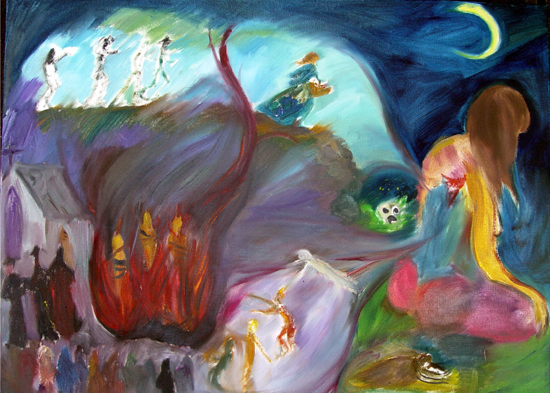 It would certainly explain the demons and scary images that keep appearing in my paintings and my dreams,” said Thea. “You betcha. A lot of people definitely think we’re weird.” said Owen. “Did you know that ‘weird’ means ‘witchy’?“ interjected Ursula. “I think maybe I’d rather watch them by myself,” said Thea. There was a silence for a beat or two. “That was spoken pretty powerfully, Ms. Bear. You sounded like an oracle,” said Owen handing her some cash for the crystal he couldn’t seem to put down. "We seek not rest, but transformation. We are dancing through each other as doorways."